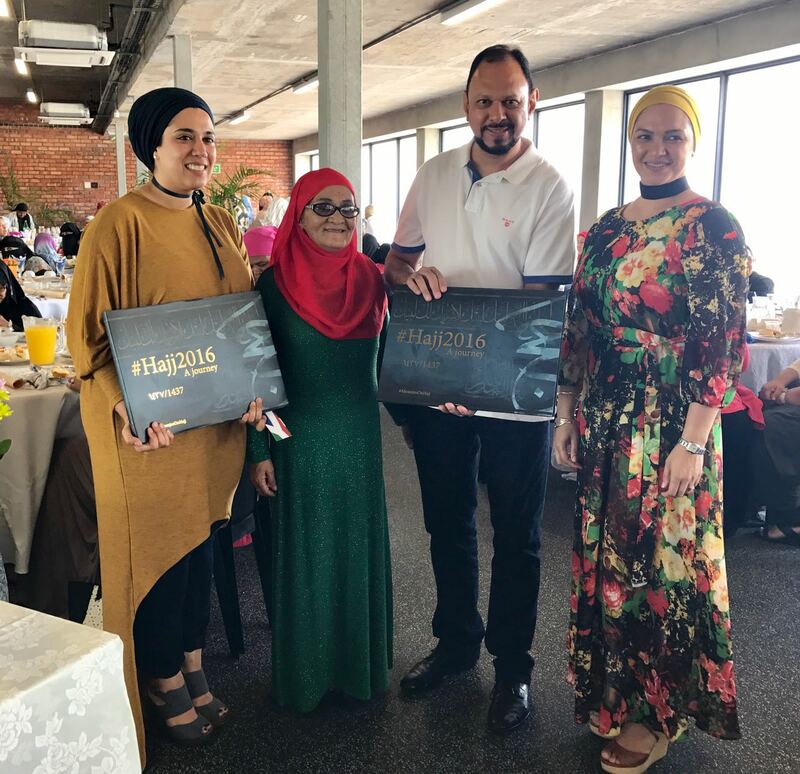 Port-Elizabeth: A leading social cohesion advocate, activist and member of the Muslim community has called on locals not to travel to Syria and other other conflict regions to join in the wars. 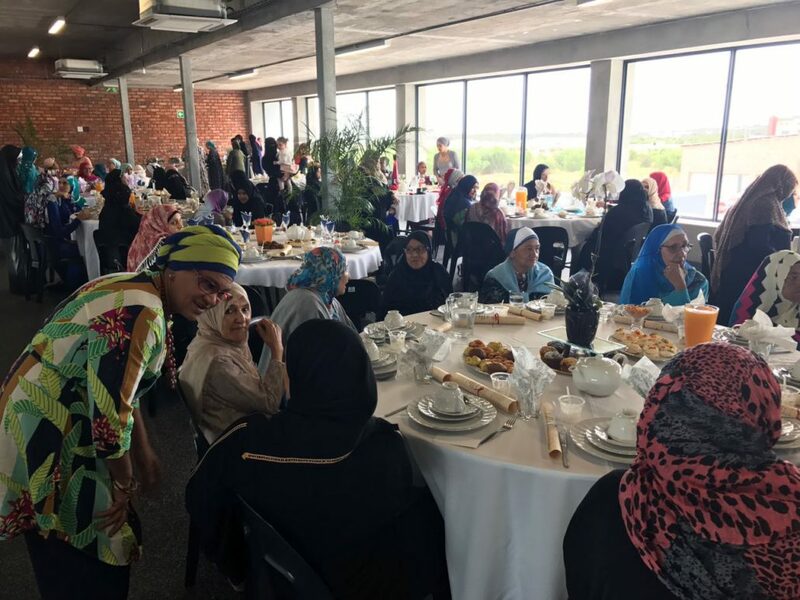 Yusuf Abramjee was addressing over 200 women at a ladies fundraising breakfast in Fairlands Port Elizabeth today. He said news emerged last week that two young men from South Africa were killed in the Syria conflict. They apparently joined rebel groups. Abramjee said the one victim was from Port Elizabeth and the other from Durban. Both were in the 20’s. laws prohibit it also. 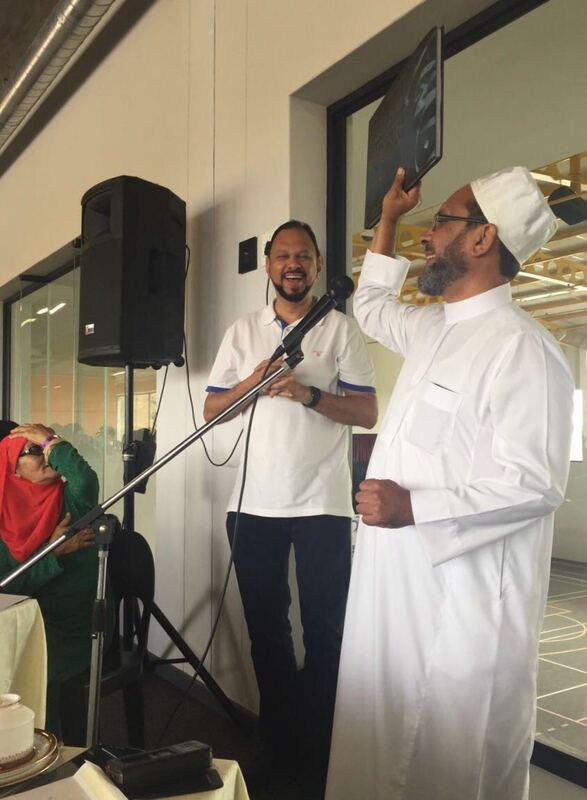 I am happy many Muslim leaders agree it is not ‘Jihad’,” Abramjee said. 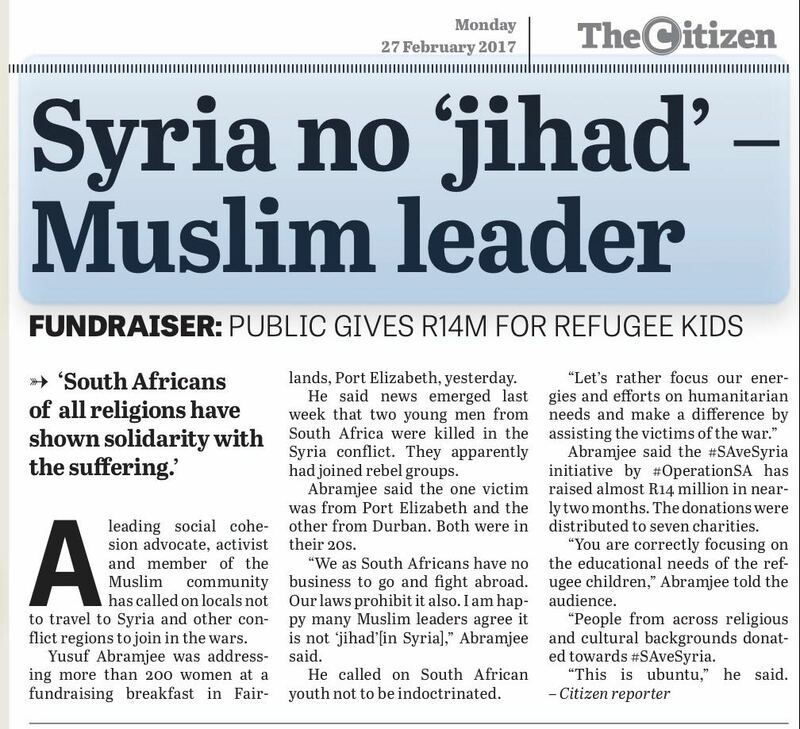 Abramjee said the #SAveSyria initiative by #OperationSA raised almost R14m in under two months. The donations were distributed to seven charities. “We will ensure that every rand donated goes to those in need and not for salaries, commissions, travel costs, etc. 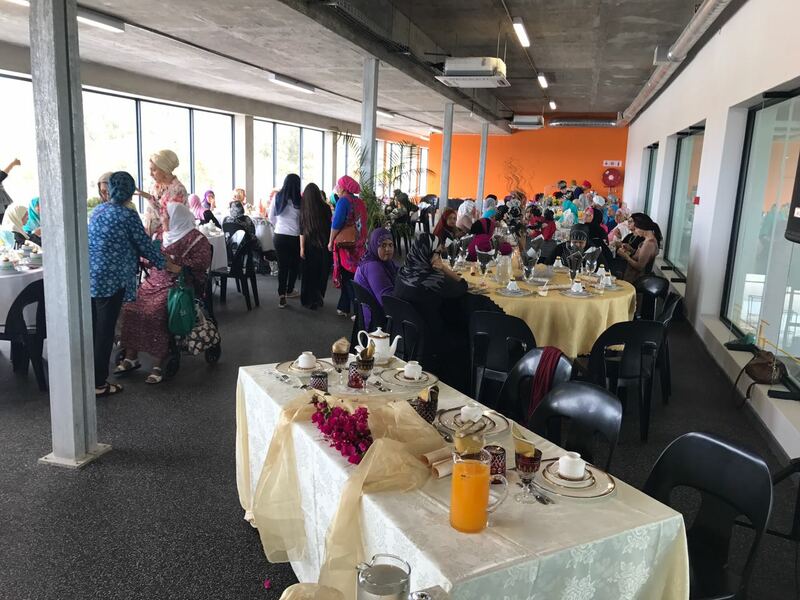 “I salute the ladies of Port Elizabeth for taking the lead and assisting Syrian families now living in the Eastern Cape. “You are showing you care. You are correctly focusing on the educational needs of the refugee children. Let’s continue to support those in need,” Abramjee told the guests. Abramjee said suffering in Syria was of “epic proportions and we must continue to assist when and where we can. “Representatives from several SA charities have travelled to the region to assist with humanitarian efforts. Please continue to assist,” he added. Abramjee said the Turkish based IHH Humanitarian organization was building the world’s largest orphanage in the border town of Reyhanli. Over 1100 children will be accommodated when it is officially opened in a few weeks. “The harsh winter conditions have delayed building work. Abramjee said South African NGO’s including the Al Imdaad Foundation and Jamiatul Ulama SA have donated towards the modern facility. “Killing innocent people, be it by the Syrian regime, ISIS or any other group is unacceptable. We must all say NO to violence,” Abramjee added. PRETORIA – The South African Police Service (SAPS) Brooklyn is now at the tip of your fingertips with the use of technology such as cellphones or tablets. Brooklyn SAPS and Namola are combining and aligning crime fighting efforts in the east of Tshwane. 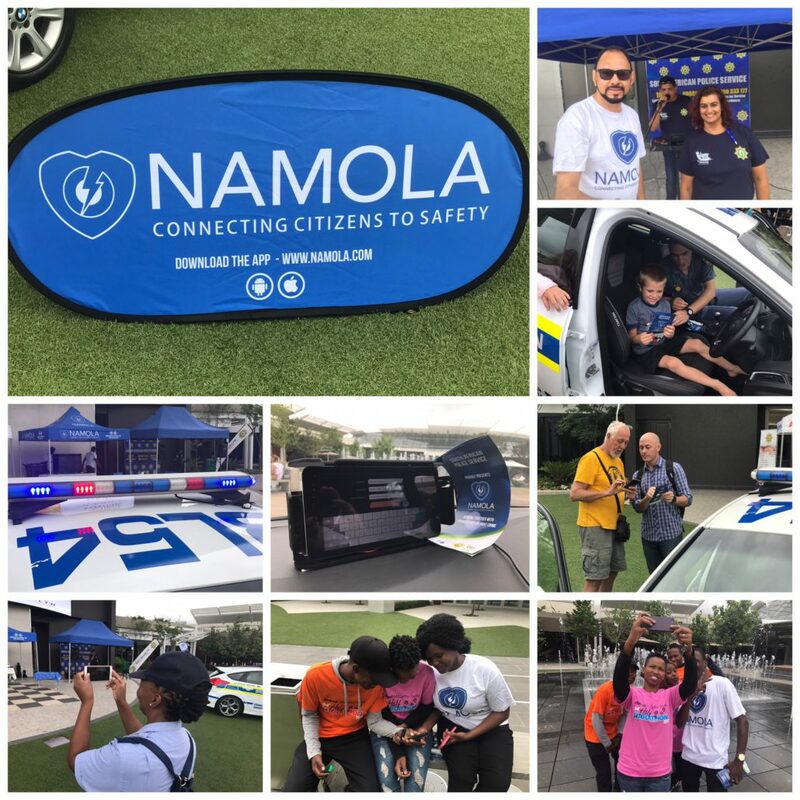 Through installing the Namola application on mobile devices, users will be able to report on-going crimes or emergencies to SAPS patrol vehiclesimmediately. Officers will receive information on Namola devices that are installed inside patrol vehicles which are linked to a control room. This will enable faster response times and more efficient flow of information. When a citizen sends out an alert the nearest Brooklyn SAPS and Tshwane Metro Police Department (TMPD) vehicles that are Namola app compliant are able to see the exact location of the incident. The first available officer is then directed to the incident while being monitored by the control room, which has the ability to intervene if necessary. While on route to an incident the officer is able to receive messages from the citizen and phone them if they need more information. The Namola app does not substitute calling 10111 in an emergency situation. The purpose of the app is to enhance all crime fighting resources. It gives community members another tool which will give them access to the police during emergencies. Brooklyn Station Commander, Brigadier Kushie Nair, welcomes this working relationship and pilot project with Namola and the TMPD. She said that by taking advantage of current technologies, the police will make great strides in improving reaction time and to create safer communities. Through using the Namola app, community members can be important participants in crime fighting by reporting crimes in progress or crimes that have just occurred. Residents in the Brooklyn policing precinct are encouraged to download the free Namola app http://namola.com/download which will put the SAPS at your fingertips. Assist the Gauteng SAPS to fight fraud, corruption, unethical behaviour or any other suspicious activities that could be detrimental to our success by phoning the Gauteng Standby Provincial Duty numbers: Duty General 082 313 8299, Duty Brigadier 082 444 4354. Namola Chief Ambassador Yusuf Abramjee who signed the MOU said: “We have to reclaim our streets. Crime affects all of us and we must strengthen partnerships at all levels. “#CrimeMustFall and we must also use technology. We have to reclaim our streets and this partnership is going to make a difference. “We salute the Brooklyn SAPS for taking the lead and we want other areas to follow. We are taking Namola nationally. Namola App is free and it works,” said Abramjee.